Hello, and welcome to Marketing Speak. 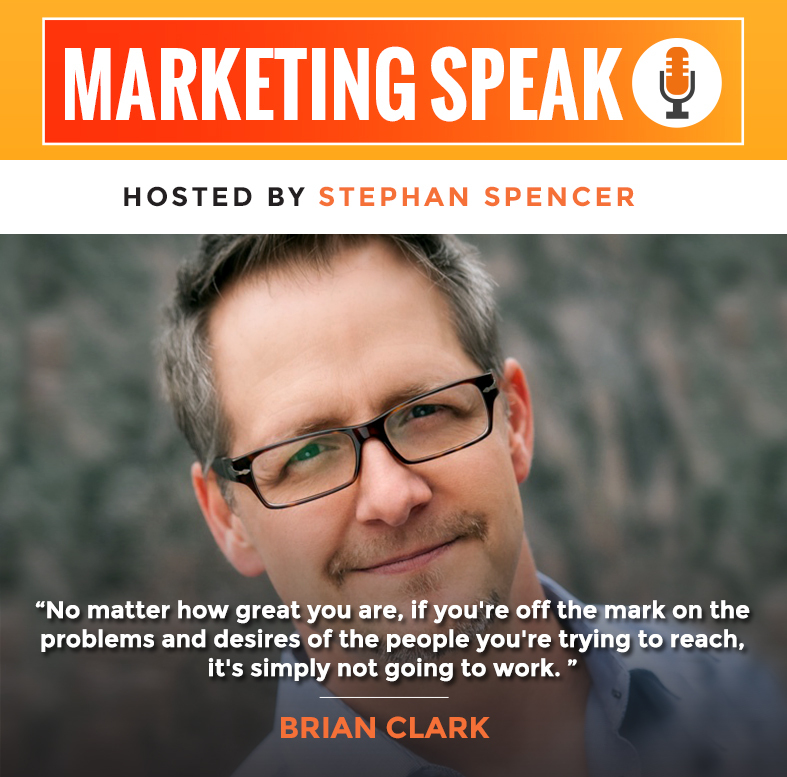 I’m your host Stephan Spencer, and today I have the distinct pleasure of welcoming Brian Clark on to the show. Brian is the founder and CEO of Rainmaker Digital. He’s the host of the Unemployable podcast. He is the chief blogger at Copyblogger where he started in 2006, blogging on copyblogger.com. It was a simple one-man blog, and he built it up into a huge business rebranded it Copyblogger Media to Rainmaker Digital. It has over 200,000 customer, and eight figures in annual revenue. It’s a powerhouse. He just completely bootstrapped this thing from a $1,000 in seed capital and turned it into a mega business. We’re going to be talking with Brian about content marketing, copywriting, blogging¸ and all sorts of cool stuff that will hopefully turn your business into a content marketing powerhouse as well. With 334,000 people on his e-mail list and 25,000 listeners on his Rainmaker.FM podcast network, he knows how to get serious reach, and by the end of this episode, hopefully, you will too. Welcome, Brian! It’s great to have you on the show! Let’s start with just the idea of killer content, right? Before content marketing was a thing that you could put air quotes around, you were doing content marketing, and you just called it “killer content” or just creating great stuff so what are the secret ingredients for killer content that you’ve found? Well, yeah. It dates back to 1998, and that was really when I started publishing online. It was also the beginning of my entrepreneurial journey. Pretty rocky at first, I had no clue what I was doing. I wanted to write, but I didn’t really want to go to New York or Hollywood. I wanted to use this new thing called the Internet because I saw other people publishing email newsletters or “e-zines,” as they were called. This was way before blogging caught on. I was like, “I could do that!”, and I did do that. I was successful in building audiences in the early days, but I was not successful at making money because I thought you were supposed to sell advertising, and at the time, the online advertising space was very, very new and fragile. Even today, it’s kind of dicey outside of Google and Facebook because the banner ad was just a bad idea, but that’s a whole another topic. It wasn’t until 1999 when I read Seth Godin’s Permission Marketing that I kind of understood that what I was doing here was building marketing list as opposed to the old-school direct mail thing of buying list. You had to earn permission. You had to get people to raise their hand and say, “Yes, I want to hear from you.” That was about delivering content, yes, but it was also about being able to get people to buy your products and services, not advertising necessarily, and so that really was my light bulb moment. Then, fast forward to 2005, I had created three successful businesses in law and real estate, and I was ready to, I guess, transition to the next thing. I was really interested in what was happening in the blogging space because it seemed like most of these nascent kind of pro-bloggers, if you will, were making the stay mistake-creating content hoping to get paid by ads. That’s when I came along with this idea for a site called Copyblogger, which was really the intersection of copying content from an engagement and traffic standpoint, but all the idea that you create content and build audiences to sell things. That was kind of a revolutionary thought in that space in 2006. Now, of course, we call it content marketing, and almost everyone seems to be doing it. Yes. Copyblogger really kind of started a whole niche of content marketing before that was the term, and it was really focused on this idea that you’re going to add lots of value and do it in a way that wasn’t the traditional approach. 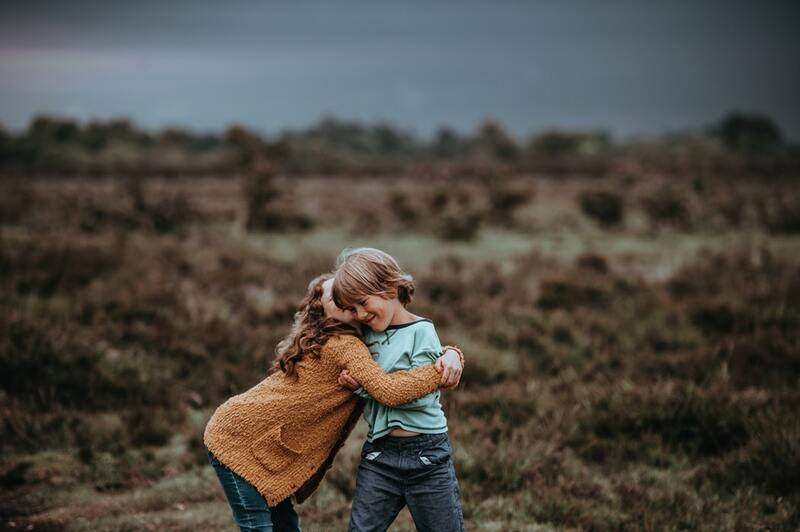 You’re not going to rely on advertising revenue, and you weren’t going to just the hard sell your products, but you’re going to add massive value and create a community. You’ve created an incredible community of hundreds of thousands of people who are paying you money, hundreds of thousands more who are on your email list, and you’ve got tens of thousands of listeners on your podcast shows-what are some of the tips or things that people can apply next week that would help them build their fan base and their market? Yeah. I think there’s two components of great content: Number one, of course, it’s got to be the right information for the right people. No matter how great you are, if you’re off the mark on the problems and desires of the people you’re trying to reach, it’s just simply not going to work. However, putting that aside for a second, if you do have a good idea, who you’re talking to and what they’re interested in, it’s really a combination of what you say, and I would characterize that as high value. There’s a saying that says, “Really great content marketing is giving away information worth paying for.” That’s what you should strive for so, what is the appropriate value for your target audience-your ideal prospects, avatars, or whatever you want to call them? The second thing, and this was really the door components of what copy blogger is still based on ten years later, but especially when it started was-how you say it matters too. How compelling your headline is matters. Again, in the days of BuzzFeed and click-bait, this is old news, but, again, at the time, it almost pains me to see how people use headlines to attract people and then let them down because they’re not giving the value when you arrive. That was something we preached from day one, which is, “It’s not enough to get them there, it’s what you give them when they’re there.” Never forget the “what.” What you say, what you deliver the value, but again-headline, and then just basic copywriting principles such as you have to open with a compelling statement-just like when you are giving a presentation or speech live, you really need to catch the audience’s attention. One of the things, I think, that clicked for me early on when I finally realized that I needed to study copywriting around 1999 was this advice that the goal of each line, each sentence, starting with the headline all the way to the end, is to get someone to read the next sentence because you want your “what” or your value to be consumed, and if you lose people because you’re long-winded or you have five-sentence blocks of text that make people zone out on a computer screen or a phone or whatever the case may be, all of these little things, you always have to keep in mind that you don’t want to lose people because if you do have that value in the information that you’re presenting, the more people that consume it, the more people are going to join your audience on a permanent basis, and, hopefully, become your customer or client at some point. The more people that consume your information, the more people are going to join your audience on a permanent basis, and, hopefully, become your customer or client at some point. Yup. It’s almost like you are writing cliffhangers into every paragraph so that people don’t drop off because people’s attention spans in front of a computer screen, especially when they’re internet-connected or mobile screen is just really minimal. It’s, like, less than a goldfish, normally, and I’d say less than a gnat when they’re in front of their computer or their mobile phone so capturing their attention, not just with the headline, but every step of the way through the whole article or content pieces is absolutely critical. Yeah, and there are tried-and- true ways of doing that that day back a hundred years ago, right? A lot of this was communicating these fundamentals of copyrighting, which people think of as an advertising discipline and saying-well, to a certain degree, in the kind of battle for attention, an ad and an article have the same function in that if people don’t pay attention, you haven’t accomplished anything. Ogilvy, yeah! He would spend 80% of his time writing the headline and 20% writing the rest of the ad. It could be a whole huge page or a full page ad, and he would spend 80% writing that headline. A good rule of thumb is the first 50 words-headline and lead. Most copywriters and, now, I think most experienced content creators know that if you catch someone and hold them through the first 50 words and it’s good value-again-then, they’re going to stick with you so, you maybe get to ease up a little bit more in the body, but at that point, I’m still using compelling subheads to break up the text, shorter paragraphs, bullet points, and all of these things because the reality is, people scan and then they dive in if you passed that first test. There’s a lot of great content out there that doesn’t pass the first test, and it gets ignored, and that’s a shame. It’s a good way to put it! Yeah. Well, we remember from English class in school transitional words and phrases, and that seems like a completely unsexy thing and yet, when you geek out as a copywriter or a modern content creator, those transitions are what keep people going, right? The concept is of the slippery slide, where everything reduces friction and actually increases motivation to continue down. Yup. I remember a Conductor study, where they looked at headlines and reader preferences and found that the number-based headlines were, by far, the best-performing and the most preferred, and the worst performers were the question-based headlines, which, for many, would seem counterintuitive like-you’d have some compelling question that’s your headline, and then people just wouldn’t want to click on it. That’s interesting. I have a lot of luck, and I use question headlines quite a bit. The key why those fail is that, it has to be a question that the reader can’t answer, and people mess it up all the time. That’s a rookie mistake. No offense to anyone. No, that’s a key distinction-absolutely! Yeah, but the number-based headlines and, again, you’ll hear the more sophisticated among us, the veterans, just complain about the listicles, and part of that is, low quality content-bad “what,” bad value, or lack of value, if you will. However, a meaty article structured into numerical reasons or sections or whatever the case may be is a very compelling strategy and always will be because the specificity of the number-based headline tells the reader exactly what they’re in for, okay? Now, specificity is important for headlines and good copying content across the board, but as you said, a lot of people will read a headline, but about only 20% of them are going to click on an average headline. You want to raise that percentage to get more people there so, specificity, in general, is incredibly important. Don’t make a vague, clever headline because people are going to process it the way you think they are. We all like to think that people are giving us more attention and more credit. Someone like Seth Godin can get away with it because he’s Seth Godin-special case-and I see people try to emulate him all the time, and it’s a mistake. It just is. Even I can’t write headlines like Seth Godin and get the traffic I want, and I’ve been doing this for a long time. Yup, got it! So, really focus on the headline and create something really compelling. Another thing from that Conductor study, and there’s a great write up kind of summary of this study on www.Moz.com, the headline of that article, 5 Data Insights into the Headlines Readers Click, I’ll include in the show notes a link to this particular article, but they found that reader-addressing headlines were also pretty high-performing followed by how-to headlines then, normal headlines, and the last or worst-performer was question-based headlines, but I think that distinction needs to be made from a question that the reader can’t answer. The number-based headlines, 36%. Reader-addressing headlines with the word “you” or “your” in the in the headline, 21%, and then down from there. However, you can’t just write click-bait type headlines that don’t deliver on the promise too, right? There is this article that is making its rounds now on I effing Love Science (www.iflscience.com) called, Marijuana Contains Alien DNA from Outside of Our Solar System, NASA Confirms, and it’s got 40,000 shares, and it’s blowing up and going viral. People are talking about this without bothering to read the article. They’re commenting, sharing, liking, and everything, but they never read the article. The article has nothing to do with the headline. It’s just a test to see if you’re actually going to read the article. Yeah, I know. I’ve seen more and more of those type of articles pointing out that there’s this lemming-like social media behavior. Back in the day, that surprised me. That was one of those things that was surprising because social media, even during the nascent years-now, remember, before Facebook came out of dorm rooms and before Twitter existed, there was the old Digg.com, right? It was a social news site where the users or the communities would vote things up, and that was how you got more attention and, hopefully, to the Digg home page, where your traffic really blew up, but it became apparent even back then, and this was like 2006 to 2007, that people were up voting on the headline alone so, from a traffic standpoint, you, again, want to make sure that you wrote the best headline possible, but from a content marketing standpoint, if people are disappointed when they get there, they’re not going to subscribe and they’re not going to do business with you. You know what I’m saying? It’s an interesting phenomenon that might make someone think that the content doesn’t really matter, but it does. Most click-bait only happens in the context of advertising-based business models, which we know are struggling. Mm-hmm, right. You’re not going to create link-bait, but if it’s a major chore for you to create unique content that is really valuable like, I don’t know, commission or do your own research study or something like that, you might just kind of take the lazier person’s approach and just curate existing content, right? If you’re a plumbing supply company and you’re looking to do some content marketing, you might create an article of the 30 craziest urinals from around the world, and just hop on to Flickr.com or Google Images, go to the settings, it’s a commercial use in the licensing for the images, and find some really crazy-looking urinals, assemble that into a blog post, and there you go! You didn’t have to travel the world-you just had to do some clever searches and write a blog post around the content you found, right? Whether it’s images or YouTube videos you’ve embedded into your post or whatever. Does that still work or is that something that’s kind of fallen by the wayside? It really depends. I mean, content that doesn’t address the beginning of the journey-the process by which you choose a plumber or a SaaS product, whatever the case may be, it’s not really meeting your ultimate business objectives. Traffic is not the same thing as subscribers, sales, and all of that kind of thing. That’s a mistake that people make, but that doesn’t mean it can’t ever work. I mean, there are some really well-researched pieces out there that are more or less pulling from other sources and yet, there is value in there that says, “This source of content is addressing what I’m concerned with so I’m going to pay attention to them overtime.” This is why email is not dead and is still the core transactional engine of the Internet because unless you can keep in touch with someone, you’re not going to convert people to customers or clients at any sort of rate that you’d like. There’s this misconception out there that traffic is king and that social media killed email, and you know it’s not true, but it’s a perception so I think you get this content creation mentality that says, “We need the shares, and we need the traffic,” when really, that’s only the beginning point of the process. Let me put it this way: It’s better to have low traffic and low sharing among the right people than it is to have some viral home run that results in exactly zero business benefit. Yeah, true. Some people think of content marketing as a short cut to the top rankings in Google organic rankings, right? If they can rank for a really competitive keyword because they’ve done some really killer content marketing, and maybe they’ve written stuff that has no appeal to their customer base, and it’s really targeting the Linkarati or the influencers, they could still get a home run out of that, right? That’s true, and here’s what we did: We ranked for some pretty competitive terms, but they’re all what we call “cornerstone topics” or “cornerstone content” in the sense that these are the things we talk about at Copyblogger-copywriting, SEO, email marketing, landing pages, and you got a whole list of these things so what I did early on was aggregate posts about those topics onto what I call a content landing page, and all of those rank usually on the first page of Google for the term. We’ve been doing it for 10 years, but that was our strategy-mine, I guess, when it was just me-that Google was going to get smarter. You had to create things that people liked first then, Google would figure it out and say, “Okay, people like that so we should show it to more people.” I think it’s Ray Hoffman who said, “Google doesn’t want to make your blog popular, Google wants to rank popular blogs.” Right? That’s because Google’s algorithm is looking for those signals that we all try to deduce, but more or less, they’re tied to actual engagement by actual people. Which is exactly what the client wanted, and they were right up there on the top-half. Yeah, exactly. I like to say too that SEO, similarly, is not a campaign or it’s not a one-time fix. It is an ongoing initiative just like your website is never finished, your SEO’s never finished. You’re keen on this concept of relevance, I really think that the secret to a successful campaign or initiative and content marketing is to think outside the box and create something remarkable. I’m using Seth Godin’s definition of remarkable-worth remarking about, right? 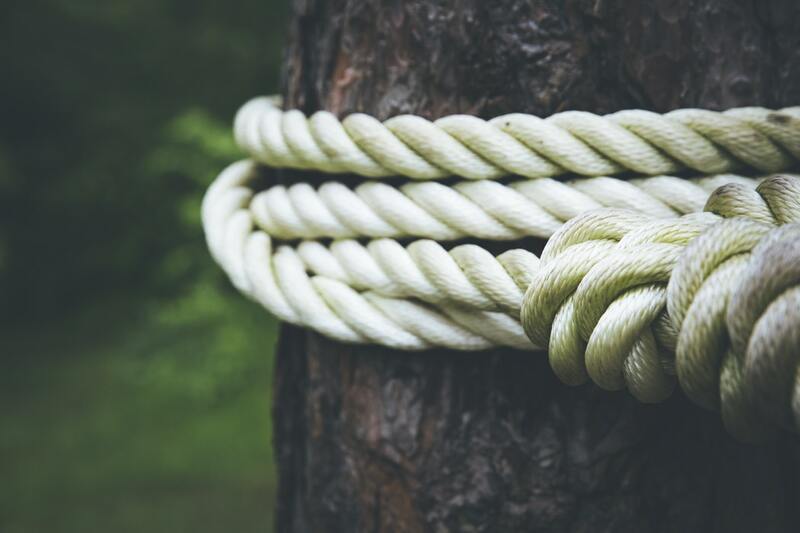 You create something worth remarking about, and you, then, can hopefully get that syndicated out into the world, and it starts to take off and go viral, but ideally, needs to be relevant to your business. A quick case example of this that I talked about with Jeremy Schoemaker on a previous episode of Marketing Speak is the “Win free business cards for life” contest, where I come up with this campaign idea, this contest idea, for OvernightPrints.com, and we ran this contest. It was up to 20 years of free business cards for a thousand business cards per year, which is actually pretty cheap, and Jeremy promoted it on his blog, on his YouTube channel, and so forth, and it did really, really well. My client went from nowhere for business cards in Google to all the way to number two and stayed on page one for a number of years just from the power of that one contest. There’s kind of that nice juxtaposition or that dovetailing of relevance with a remarkable campaign idea so it’s not, I guess, tangentially related like “19 Things You Probably Didn’t Know About Death.” The difference there is, you don’t want any of your customers to see that. And so, you’ll see some of the bolder SEO’s doing very controversial things. At least, historically, a link is a link, and traffic is traffic, whether half the people disagree with you or not. But any more, and I think, in our current climate, you can take a stand about anything without trying to be controversial. Just speak your mind, speak your truth to the people you want to attract, and half the world’s going to hate you anyway and yet, it’s still remarkable, right? Well, even if you’re not creating remarkable content. If you are remarkable-like a remarkably evil company, you can still crush it in Google. I remember working with Fluor Corporation. They’re not an evil company, they’re really cool, and they’re a huge Fortune 200 or something, they build airports, bridges, and stuff, and one of their big competitors was Halliburton. I was looking at their link profile, and there’s a lot of negative links. I mean, they’re powerful, important, and trusted sites that are linking, but the context of the link is, “I really hate this company,” and then they link to it. It’s not a no-followed link, it’s passing page ranks so they realize they’re actually helping? -the company that they hate and that they’re disparaging in their blog. Well, normal people don’t know that. Kind of funny so, yeah, I love this point that remarkable doesn’t necessarily mean that it’s a positive sentiment, it could be that they hate your guts and they’re just railing on you, but hey, it’s a page rank passing link so, it’s awesome. What’s the expression? There’s no such thing as bad press or all press is good press or something, I forget. Yeah, and I’m not sure I believe that, but I do believe in the context of links that something we started with at the beginning-that, me, talking about selling with blogs in 2006, I mean, may seem weird, but that was heretical to some of the early bloggers, right? And the people would be audiences and some of them attacked me about it, but they misjudged their audience because not only did they send me a good link, their audience was like, “Hey, I think this guy’s worth paying attention to,” so that was a miscalculation on their part. They didn’t see things changing and I did. I would hope after 10 years, Copyblogger and all the other blogs we have now that they would get it, but I think you’re right to some degree, or I think people just feel like, “I don’t have to try that hard,” and trust me-you have to try hard. Yeah. What would be your favorite resources for books, websites, and things? Of course, Copyblogger is on the list, but some of the old school sort of resources, tested advertising methods, scientific advertising, David Ogilvy’s work, or any particular favorite resources you recommend? The interesting thing here is, the fundamentals haven’t changed, and there are so many of these great books like you’ve read. Joe Sugarman’sAdvertising Secrets of the Written Word is my favorite copywriting book because it’s essentially the same principles as the most sophisticated book out there, which is called Breakthrough Advertising by Eugene Schwartz so Sugarman, basically, gave the easy reading version of Schwartz’ principles so you kind of graduate your way out to Breakthrough Advertising. But here’s the issue that, I think, I was able to overcome because there are a lot of better copywriters in the world than me, and a lot of them are from the old school direct response/direct marketing world, and a lot of these guys struggled moving over to the Internet because, I guess, I understood how to take what they knew and apply it in a new context, and they more or less kept with their existing habits if that makes sense? He’s an amazing and persuasive writer, but no one would ever accuse Guillebeau of being hype-y and yet, I’ll look at any article or any copy he writes and I’ll go, “There’s this fundamental, there’s that fundamental.” He’s hitting all the fundamentals, but in an approach where it just smoothly washes over, and it’s incredibly persuasive so I think we’re coming back full circle to know your audience, know the fundamentals, and apply accordingly. Yeah, and even the old school copyrighting greats did this well. People like and you know people like Gary Halbert, Dan Kennedy, and so forth. I definitely-when you’re talking about how the old school people don’t really adjust to the times-that reminded me I was just at the GKIC super conference with Dan Kennedy, who was the primary speaker. He is an amazing copywriter, an amazing direct marketer, and he doesn’t have an email address. You have to fax his assistant, and then his assistant will fax Dan if it’s worthy of Dan seeing it. It’s important to get that intersection of understanding new media, and then still applying the wisdom of the old school copyrighting greats, and that can be tricky, but you’ve managed to pull it off. Congrats! Yeah, it’s a dance. It’s funny because at the beginning, there was that kind of resistance in certain quarters so I really worked hard to earn trust to over-deliver. I didn’t start with having any products and services. This is a whole other aspect of it. I paid attention to the audience and for 18 months, I didn’t sell anything until I had figured out what the first product should be, and then every year, we launch a new thing, and then ten years later, you got a bunch of stuff, right? There’s an aspect of that. I almost see a return of a little bit of notching up of the aggressiveness-especially, in the number of email messages, the copywriting techniques, and whatnot, which is fine, again, if it works with your audience or if you’re willing to lose people who aren’t going to buy from you right away. It’s always a dance. It’s always a balance. You can fail by being afraid to ask for the sale as much as you can for asking for it too soon or too often. Yeah. You have a popular podcast that you post-Unemployable-and you have a whole network of podcasts that are part of the Rainmaker.FM network so is it different the ways that you would market, be remarkable, and kind of bait people? Is it different on podcasts than it is in written form? Well, no, ultimately. I’ve played around over the last couple years with scripted audio that I try very hard to make sound as natural as possible compared to maybe a more extemporaneous outline. Both can work. Obviously, the scripted version is very tightly-controlled, but even when you’re working from an outline, your title and intro are so important. It’s interesting in the podcasting world because of sponsorship. Usually, that’s the first thing you hear because that’s how they get paid although that may not be the smartest way to do it from an overall standpoint. You might want to follow that 50-words rule-your title and your opening, and then go to your sponsor message to make sure you’ve got them on the hook to keep listening. They still hear the ad. It’s kind of like storytelling when you get down to it. I think podcasts like Serial, StartUp, and the bigger examples we have out there that really kind of broken into the mainstream, they’re exceptional storytellers and that’s what good content is. That’s a great point. Speaking of StartUp podcast, I just met Alex Bloomberg at Podcast Movement last week, and he’s got a great online course about storytelling for podcasters on CreativeLive.com so that’s a really great resource. It’s inexpensive-I think it’s under $100 for people who want to explore this idea of doing great storytelling. It’s so amazing what Serial, StartUp, and the different NPR podcast are doing in terms of mixing it up so it’s not just monologue or dialogue. I’m thinking I need to make a shift in how I’m producing my episodes because my first, quote-unquote, 50 words are just the same intro thing at the beginning of every episode, and people get tired of hearing that over and over again-they skip past it. But, if I only have a certain period of time like 30 seconds or whatever to convince people to listen to my podcast, I should probably take some snippet, some really compelling piece from the interview, from the meat of the interview, and lead with that, and then do the intro. If I ever have sponsorships, then I’ll have the sponsor message after that. Is that something that you guys do? You follow your own 50-words rule and start with something really compelling at the very beginning of the podcast episodes? Yeah. I’ve experimented with a lot of different things because I’m certainly more comfortable writing. It just comes more naturally that you the words on the screen and you realize that you’ve got to juice it up a little bit to make sure you don’t lose someone. Sometimes, I will write my intro only, and then, of course, I go to an interview. It’s funny on Unemployable, I came up with this idea when I do interviews that there’s a cold open, where the guests speaks first and they say who they are and what they do, and then they’re completely “unemployable.” These are all entrepreneurs or freelancers. And then it goes into so, that’s very catchy, and has a lot of people enjoy hearing what each guest is going to say, and then it goes into the standard music and kind of summary of, “This is Unemployable. The show for freelancers and entrepreneurs… blah- blah-blah,” and then I go in, and that’s where my 50 words start. I mean, if you’re not counting the title. It’s, basically, the same copy that I write for the post on the site, which is designed to get them to hit play, so you see- the functionality is the same. If they’re a subscriber, they’re not going to read the post, it’s just going to show up, and they start listening to it so I’m going to hold their attention verbally. If they show up to the website and want to decide if they want to listen to this-same concept, right? One is maintenance, and the other is action, but they’re really the same words. There’s an interesting story about the way you put that. I realized, I guess, by looking back over the last 18 years, because when I quit the practice of law, I thought I wanted to be a writer, but it was no accident, I guess, that I kind of shunned all the traditional pass, but it wasn’t until later that I discovered I was an entrepreneur who could write, and this is very fortunate for me because I didn’t know that content marketing was going to become a $44-billion dollar industry. I just knew that I wanted to write; that if I build an audience, I could build a business; and I loved building businesses so that was a realization for me. I like the way you’ve put that, but when you take it to the very next step-a lot of writers and speakers are entrepreneurs in that sense as well. But really understanding that your ability to communicate and add value is what marketing has become. Yeah, but knowing where you would gravitate towards or where you’re kind of better more wired to succeed-like, for me, it’s speaking. I write a lot because, of course, I’ve got all these articles, books, and so forth, but it’s painful for me. Yeah. I think it’s painful for everyone. Well, the thing that kills me is that people who, when you say “writing,” and they think “text,” and I’m like, “You’ve got to have writing for podcasting even, again, if you’re only doing an outline.” You’re structuring a persuasive presentation-just like if you were getting on stage. What about video? Have you ever watched one of these videos where someone just gets up there and rambles? It’s painful. People don’t realize that these YouTube stars put a lot of work into figuring out what they’re going to say before they turn that camera on. Well, that’s more like creating a structure, which, yeah, you probably are writing that out, but I’m in the flow and I’m in my gift more when I’m speaking than when I’m writing, and it just seems to be more effortless so I always look for opportunities now knowing that I’m a speaker who writes versus a writer who speaks. I look for opportunities to speak more. And this podcast is a great example because ideas are out there. You can have them transcribed and then, of course, you’re repurposing your content. There’s a full circle of content marketing life, if you will. Yeah, like I just did with my other show. I have another podcast called The Optimized Geek. By the way, all your listeners really should subscribe to that one too. It’s an awesome show! I had an episode with Elissa Harris, and one of the topics we covered was impostor syndrome. The audio discussion that we had like there is also comparative success syndrome, which I had no idea about, I incorporated that into a Huffington Post article because I blog for The Huffington Post, and that’s a great article that came about because of the audio conversation that we had on that podcast episode. Yes, I know that one well. Because it took, at least, five or six years before you should have even thought about that. Well, I actually started podcasting in 2007, and it didn’t really get much traction for me. I did it in conjunction with my previous agency, Netconcepts, and then I stopped because it wasn’t really getting traction. I’m glad that I revisited it and decided to jump on the bandwagon last year. It was funny. Our first podcast in the Copyblogger world was 2010, and I haven’t gone back and listen to them, but Robert Bruce, who was one of my co-conspirators, said we were absolutely awful, which I don’t doubt. We had a good time, and we had a small segment of the audience that would listen, but we were so used to the reach that we were getting. We text and even infographics and stuff like that that we stopped and in hindsight, I wished I would have kept going because you develop the skill by doing it. I think with audio or any speaking skill, it truly is something that you have to do in order to get better in my opinion. Yeah, so one last question here: I can round up the episode here: What would be, one, two, or three max, kind of little bits of concrete and specific actionable pieces of advice that you would give people to implement next week? What would be some real low-hanging fruit for people like, “use this particular tool” or “go back and rewrite the headlines of your five most popular articles” or what would be like real low-hanging fruit for our listeners? Well, I think it’s so important that if you’re not getting the results you’d like, make sure that you understand who your audience is or who you’re trying to attract to your audience. That happens with just so much surprising frequency. Usually, it’s people running to the latest tactic or this or that to fix a problem that is fundamentally at the root. I don’t know how low-hanging fruit that is, but nothing else you do will work if you get that part wrong so every copywriter in the world does copious amounts of research before they ever write a word, and that is what needs to be done before you launch any kind of content marketing initiative or a new website or what have you. Always start there. Who are they? What are their problems and desires? What does the world look like from their standpoint? Put yourself in their shoes and walk in them, right? That’s empathy. Empathy is the key thing to succeeding with audience-building for the purpose of business-building. Something you brought up is interesting and, I think, is a good advice, which is study up on headlines and then go back and rewrite headlines. I do that to this day, and that first headline was probably pretty good yet, it can always be better. That is actually a good advice that came from you. Not that you don’t give good advice all the time-you know what I’m saying. I would also look for opportunities within the existing content to get people onto your email list so it’s commonly referred to as content upgrades these days. Go through your analytics, and see what your popular posts are. Go back to them, and then figure out what can I offer related to the topical focus of this article which people have shown me through data that they’re interested in? How can I give this traffic the opportunity to opt-in for something related but even more valuable? Because email building is the central activity of content marketing, and it’s going to remain that way until some sort of messaging kills email, which might not happen in my lifetime. Who knows? I don’t know. It’s not going to be Slack, that’s for sure. It’s not going to happen that soon either so, focus on-how do I go build my list? If you’ve got existing content assets, that’s where you start. A lot of times it’s always create the new thing and throw advertising at it, which you may want to do as well, but I would start with an audit of your existing popular content and figure out how to make it work harder for you. Awesome! Well, that’s a great advice. I love how you mention empathy and how important that is to really providing value and being relatable and all that. That’s just so important because marketing is serving if you do it well. With that, let’s wrap up the episode. I do want to give you an opportunity to plug any website or service that you want to mention to our listeners. Do you want folks to go to Rainmaker.com, Rainmaker.FM, or Copyblogger.com?Where do you want to send folks for more information and more learning? Yeah, we have a lot of properties at this point so here’s what I generally advice: If you’re kind of newish to content marketing and you need the fundamentals, go to Copyblogger or specifically, my.copyblogger.com and register for our free library of eBooks. We cover content marketing extensively, email, landing pages, SEO, copywriting, and several other topics, which are completely free. If you’re more of an audio person-and you might be given that you’re listening to this-head over to Rainmaker.FM and check out some of the shows there. We’ve got a handful of different topical approaches like content marketing digital entrepreneurship and things like that. Then, finally, I would say if technology is what’s holding you up, head over to RainmakerPlatform.com. That is our flagship. All-in-one solution for digital marketing and sales. It’s what we use for our own sites. We spend a lot of time building it, and we’re really proud of it. Technology can be the hindrance at this point, especially in a world where marketing automation and advanced email marketing, and these type of things are becoming the norm, and not an advance strategy, so take your choice. All right! That’s a lot of homework for folks to take, and I hope you guys do take advantage of this. Also, of course, go to MarketingSpeak.com. Check out the show notes from this episode, and we’re creating a checklist of action items to take from some of the discussion points that we talked about in the episode so go check that out on MarketingSpeak.com. We’ll catch you on the next episode of Marketing Speak. This is Stephan Spencer, signing off! community and add massive value to your followers, and the sales will come naturally. of your target audience, and build information around that demographic to give away. content and grow your audience! won’t want to come back. ☑ Your goal from a headline to the end of an article is to get someone to read the next sentence. Remove information that is unnecessary or that isn’t adding value. the article. They will be compelled to click. something remarkable. What can you create that people don’t already know or have? that very specific type of customer. soon or too often. Be strategic with your call to actions. 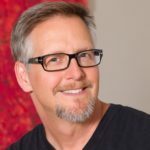 Brian Clark is the founder and CEO of Rainmaker Digital, and the chief blogger for Copyblogger. He’s also the host of the Unemployable podcast. Brian built three successful businesses using online marketing techniques, and has built his network to over 200,000 customers, and eight figures in annual revenue.